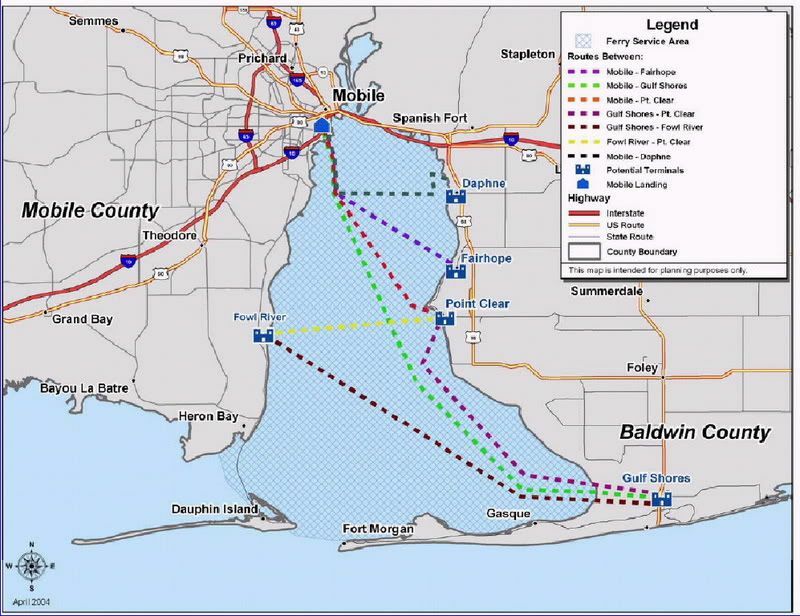 "The (Miami investors') plan is to launch a twice-daily commuter service, connecting downtown Mobile with Fairhope, and add a tourist route between Baldwin County's Point Clear and Bellingrath Home and Gardens in Theodore." Although I doubt if the ferries will become popular commuting choices, because of the high ticket cost, they would be a neat convenience for Mobile Bay-area residents and tourists. Mobile's mayor cites Seattle and Vancouver as models to emulate. Additionally, it appears there will be $2.5 million in Federal money for a second Ft. Gaines-Ft. Morgan auto ferry. The 2030 Long Range Plan, adopted by the Mobile Metropolitan Planning Organization in 2005, calls for Bus Rapid Transit (BRT) between downtown and the airport, and for passenger ferries across Mobile Bay between Mobile and Baldwin Counties. The study that the 2030 Long Range Plan was based on did not recommend any rail transit for the area. Just out of curiosity, is it "engineerable" to have a light rail line run through the old tunnel from Baldwin and then down government? I always thought that the above route would be the potentially most successful rail line in the area. Also, I think the idea of the ferries is great and I think the benefits of it to downtown are underestimated. GS/OB have millions that come down each year, many for a week or more at a time. If Mobile can just get a fraction of those who visit the gulf to come and visit downtown on a "day trip" then it would be a massive boon to Dtown, Mobile as a whole, and even Baldwin. But, no such industry can develop if there is no viable transit between the two areas. Initiate daily ferry service between Mobile and Fairhope, primarily to carry Baldwin County residents who commute to work in Mobile. On weekdays, sailings every 30 minutes are recommended during peak commuter hours. Less frequent sailings would be provided at other hours. Limited service would also be initiated between Mobile, Gulf Shores, and Point Clear using excess ferryboat capacity during off-peak hours, on weekends, and during the summer months. If sufficient demand develops, one or more additional ferryboats could be added to the fleet to provide service on these routes. Initially construct three passenger ferry terminals, one at Mobile Landing adjacent to the cruise ship berth, and the other two in Baldwin County at Fairhope's Long Pier and in Gulf Shores on the south side of the Gulf Intracoastal Waterway adjacent to the SR 59 Bridge. Give consideration to phased development of additional terminals at Point Clear, Fowl River, and Daphne after future passenger traffic analyses and trial runs indicate that they are justified. The Gulf Shores terminal would allow limited service to be initiated between Mobile and Gulf Shores using excess ferryboat capacity during off-peak hours, on weekends, and during the summer months. If sufficient demand develops, one or more additional ferryboats could be added to the fleet to provide limited service on this route and to an existing facility in Point Clear. Provide parking facilities at or near the terminals and then implement intermodal connections with public or private bus or van services. Procure three high-speed (40-knot) catamaran ferryboats to initiate scheduled service between Mobile and Fairhope. The ferryboats should have the following approximate capacity and characteristics: 75-passenger capacity, draft of less than five feet, and a low-wake hull. Service could be initiated with chartered or used ferryboats if boats with acceptable features were available. While service between Mobile and Fairhope could be initiated with two ferryboats, only limited capacity would be available to operate selected trips to Gulf Shores/Point Clear and to test other routes. I don't think it's feasible to put trains in either of the tunnels, but they could run beside the I-10 bridge across the bay. The I-10 bridge will likely be widened, so rail could be included as part of that widening to save the cost of a special project. I wish light rail could be established from the airport to downtown and then to Baldwin County. Last year the talk of the new bridge over the bay.... The idea that sounded crazy ,and was laughed at was the one linking so. mobile county to gulf shores. (Tampa- st. pete, San Fran- Oakland are examples ) 50 years from now we will be saying" only if they would have built it" when the two counties will be filled to the gills with people. Starting in Grand bay going throughthe bayou to fowl river. then a highrise bridge over the bay meeting hwy98 just south of point clear in baldwin co. and catching I-10 over in P-cola. This bridge/causway could be longer than the one in Nawlins. This idea might seem a little far fetched , but with the growth of the surrounding area in the long run this is the ticket. I wouldn t think Mobile or the eastern shore would dry up from this major artery. just look at the map in the post before me (thanks) it's a straight shot.....and o'yeah..."Damn the torpedos Full Speed Ahead", (1864). The number of riders on Wave system buses increased 23 percent in the budget year that ended in September 2006, and by 30 percent in the first five months of this year. Ridership increases far outpaced nationwide increases of 0.4 percent in 2005 and 2.3 percent in 2006. However, Mobile's per capita bus ridership was third lowest among 14 similarly sized Southeastern systems. Consultants made recommendations to the city to increase ridership, including altering some routes, attaching scheduling information to bus stop signage, and running routes twice per hour instead of just once. Business leaders would like to see a regional transit system to serve Mobile and Baldwin Counties, especially with service-sector jobs in Baldwin County that could be filled by Mobilians if convenient transportation were available. Mobile currently subsidizes bus service to Prichard, Tillman's Corner and west Mobile. BRATS, Baldwin County's bus system, will begin running four trips per day to the Wave hub at the GM&O building this fall. Thus far, though, no other government entities have stepped up to help pay for regional transit. Officials with the cities of Gulf Shores, Orange Beach and Foley, along with the South Alabama Regional Planning Commission, hired a consulting team to put together a transit plan for the south Baldwin County area. Public hearings are being held to gauge public interest. Routes being considered include AL Hwy 182 along the beach, AL Hwy 161 between the beach and Canal Road in Orange Beach, the Foley Beach Express, AL Hwy 59 and routes through some Foley city streets. ^Consultants envision a south Baldwin bus system which would run every 15 minutes during the summer, with stops along AL 59 in Foley and some side streets. At the Tanger Outlet Center, passengers could board buses going down AL 59 to Gulf Shores and the Foley Beach Express to Orange Beach. The two routes would end at AL 182, where passengers could transfer to a beach line running from West Beach Boulevard to Perdido Pass. Between Labor Day and Memorial Day, the route would run six days a week with stops every 30 minutes. An enhanced version of the proposal includes more stops and operation until midnight rather than 10 pm. The south Baldwin route would not replace the Baldwin Rural Area Transportation System, but would link with BRATS service to allow people from other areas to reach jobs and destinations in Foley, Gulf Shores and Orange Beach. The consulting team will present a system proposal to local officials. ^In an editorial, the Mobile Press-Register called for Baldwin County officials to implement the proposed bus system for south Baldwin. The editorial points out that a public bus system, if properly operated, could lure riders who otherwise would add to the traffic problems on AL Hwy 59. The editorial also calls for Alabama law to be changed so that gas tax revenues can be used for mass transit. The legislature should get this done in the next session, but probably won't even come close. I haven't been to Mobile since around 2002, I think busses and ferries are great for the city but does it truly have the population and/or density to support Light Rail? What is the expected growth by 2030? Forth Worth, Texas-based McDonald Transit Associates, which managed the Mobile system from 1995 until 2001, will replace Cincinnati-based First Transit, which had been running the bus city's bus system since 2001. City officials said the main reason they chose McDonald was because the proposal was $75,000 cheaper. McDonald's president said there would be no immediate changes in fares, bus routes or door-to-door shuttles for disabled persons. First Transit had been considering a plan to realign some routes and try to provide service more than once an hour to some areas. During First Transit's tenure, Metro Transit was rebranded as the Wave, and regional transit services were promoted and initiated. This fall, the BRATS bus system in Baldwin County plans to start running a few daily trips to the GM&O transit center. Bus passenger trips rose 23 percent last year, and increased more than that during the first half of this fiscal year. One would think the mayor and council know what they're doing here, but successful managers (huge increase in ridership, beginning development of regional transit system) usually don't get replaced. Hopefully, First Transit will make needed route changes and continue to increase ridership over the next few years. You mean to tell me they rehired the fools that almost made the government discontinue funds for our bus system in 2001, such a bad idea. A public transit system could carry more than 1 million people a year between Orange Beach, Gulf Shores and Foley, but planners need to find ways to move buses through heavy traffic. Bus lanes may be created in the median to improve service. The roadwork and system, including buses and a 21,000-square-foot garage and storage facility, would cost about $53 million today, with the cost expected to go up about 4 percent a year. If officials in the three cities decided to start the system in 2010, the project would cost about $62.7 million. The big question remains: would anyone actually ride it? The Baylinc service began Tuesday, providing morning and afternoon transportation from the Eastern Shore to downtown Mobile and back. Baldwin Rural Area Transit System buses stopped in Daphne and Spanish Fort before heading across the Causeway, through the Bankhead Tunnel to Bienville Square. Baylinc is sponsored by the Baldwin Rural Area Transit System (BRATS) and Mobile's The Wave Transit System, at a current cost of $62,400 annually. If demand for Baylinc grows, the routes and hours could be expanded. Why don't we push for this here in Mobile? Do we have the critical mass downtown for this kind of thing yet? Do any other cities our size have them? What would be the route if we did get street cars back? They have talked about it before here. I think it would work here too.....but better in about 5 to 7 years. Which would take about that long to do it. Moda! has great ridership downtown. It is actually used by people working, visiting, and living down there. The weekday Baylinc service, connecting Baldwin County's Eastern Shore to Mobile's downtown business district, began service with two buses in November 2007 and is growing steadily. In March, passenger trips increased 25 percent increase over February and nearly double the trips in December. If the trend continues, a third bus could be added to the route by October. The ferry service between Dauphin Island and Fort Morgan will utilize two vessels during the busy beach season this year. The Fort Morgan and another vessel, the 122-foot Marissa Mae Nicole, will run simultaneously, offering passengers a ride from either side of the bay every 45 minutes rather than every 1 1/2-hours. During the summer months, the ferry often travels at capacity with cars waiting at the docks, indicating a need for a second vessel. Mobile's The Wave Transit system is celebrating record ridership with over 1 million passenger trips during fiscal year 2008, a 14% increase over the previous fiscal year.